Anyone who’s ever asked me will know that Venus is easily my favourite planet in the solar system. Sure, the place is a corrosive acid ball with a supercritical solvent atmosphere, but I love it all the same. I guess I’m just strange that way. But strange or otherwise, Venus is really the last place most people would expect to find something living. Between the pressure cooker conditions on the surface and the acid bath conditions in the clouds, surely the notion of looking for life on this world is just silly. Well, it would be understandable to think that Venus is corrosive and lifeless. It may be surprising to learn then, that about 50 miles above the planet’s surface, you’ll find temperatures and pressures almost exactly like those we’re accustomed to here on Earth. There’s even free water vapour and molecular oxygen (albeit only in trace amounts) that high up in the Venusian atmosphere. Simply, just above Venus’s clouds lie the most Earth-like conditions in the entire solar system. Excluding those found on Earth. Obviously. But Venus hasn’t spilled all of it’s secrets to us just yet. Despite being the closest planet to us, we really don’t know much about it at all. Strange unknown chemicals intermingle in it’s clouds. Amongst them, more mundane ones like hydrogen sulfide (H2S) and sulfur dioxide (SO2) have been found together in the venusian atmosphere. This is a definite sign that there’s something unusual afoot. H2S and SO2 normally react with each other. The fact that they’re found coexisting means that something must be replenishing them. Another strange chemical found on Venus is carbonyl sulfide (OCS). On Earth, OCS is so hard to produce through geological processes that it’s often referred to as an “unambiguous indicator of life”. Could these be biomarkers? Even the clouds themselves are still an enigma. 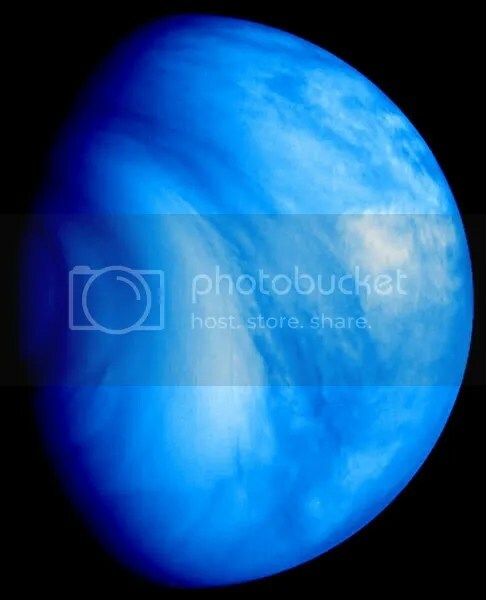 This ultraviolet image was taken by Venus Express’s Venus Monitoring Camera (VMC) shows the planet’s southern hemisphere. Ultraviolet shows the true beauty of these deadly swirls, but what exactly causes them is still unknown. The light regions are thought to be due to particles of sulfuric acid. The chemistry behind the dark swirls is a mystery. They’re thought to contain some kind of sulfur compound. S8 rings, for instance, absorb strongly in the UV. As with so many astrochemical puzzles though, the exact cause is difficult to pin down. What’s more, the different types of particle that make up the venusian clouds are loosely grouped into three categories (referred to as “modes”). The most interesting of these are the mode 3 cloud particles. Non-spherical particles much larger then most aerosols. Their size is closer to that of pollen grains or, well, bacteria. Indeed, it’s been hypothesised that some kind of venusian microbes could be behind the bizarre nature of those clouds. The idea has actually been given serious consideration. Others have suggested that some process on the planet must actually be replenishing the clouds themselves. Without being maintained, they’d gradually fade away, lasting perhaps a million years or so. Granted, SO2 released from volcanoes would be a good way of keeping those clouds topped up. But no active volcanism has ever been witnessed on Venus. We’ve seen what we assume to be volcanoes, and expect them to be active, but not one has been caught in the act. Without drawing any conclusions, it’s worth noting that certain microbes on Earth metabolise sulfur compounds and actually produce sulfuric acid. A notable example are the (delightfully named) snottites. Mucussy-looking acidophile bacterial colonies, featured in the “Caves” episode of BBC’s Planet Earth series. Snottites produce so much acid that the conditions they live in aren’t unlike those found inside your average car battery. Or your average venusian cloud. Whatever might be happening on Earth’s “evil twin”, one thing has to be said. It’s too early to rule out the possibility of venusian life just yet. Images courtesy of ESA, Venus Express and the Soviet Union. This entry was posted in astrobiology, Imported from Livejournal and tagged planets, venus. Bookmark the permalink.